Who out there plans on celebrating Halloween? If so, do you have your costume and/or party preparations in order? I won't be hosting a party myself, but I do enjoy perusing the internet for novel Holiday-related entertaining ideas, so today I thought I'd share a few of my favorite spooky finds to whet your creepy whistle. Follow Hello Pretty Bird! 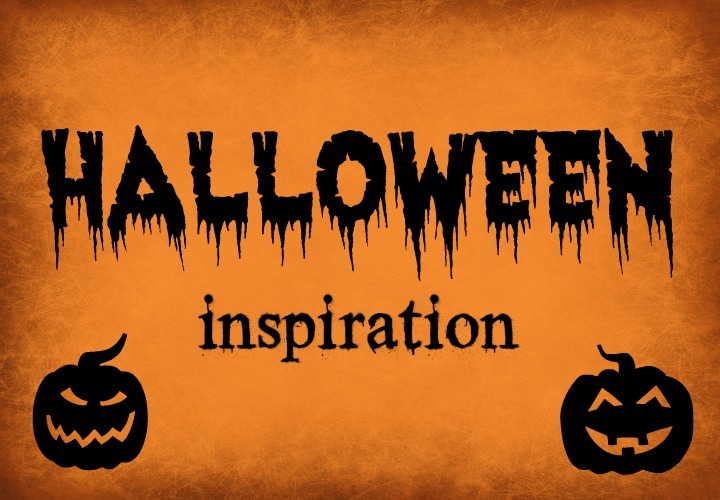 's board CELEBRATE - Halloween on Pinterest. Exactly what it sounds like—a really fun and unexpected couple costume. Though if I were doing it, I'd probably go as the delivery person and have Stan be the pizza because he's so darn cheesy. Har har har! A rather macabre vegetarian meatloaf/burger with adorable mashed potato ghosts. Cute AND creepy! Perfect for your Halloween party or gaining energy before a long and hard trick-or-treating session. A round-up of funny costume ideas for your furry friend. I don't have a dog, but if I did I'd probably go for the "Poop Factory" costume by Turtles and Tails. I'm so classy like that. The perfect beverage to put you in the Halloween mood and rot your teeth. Throw in a little vodka and you've got something amusing and sweet for the adults out there who are too old to go out and beg for candy! True story: I eat a bagel for breakfast at least once a week. How fun would it be to dress up your boring old everyday breakfast for Halloween and surprise your family/roommates/imaginary friends with it? Maybe not practical, but fun. If you're an avid Pinterest user, be sure to follow me and/or follow my Halloween board because I'll be pinning more in the days to come. As for me, I have a couple of silly costume ideas rattling around my head, but still haven't decided on anything for sure yet, so stay tuned! At the very least you can be sure that I'll be dressing up my bagels. Do you have any special Halloween plans or costume ideas? If Halloween isn't a big thing where you live, what would you do if you could celebrate? My 8 year old (who I don't think has ever actually watched an episode of Doctor Who) has declared he wants to be a TARDIS for Halloween. We have a cardboard box appropriate to his size which I will stick strips of cardboard onto to approximate molding and then spray paint it blue, and stick some sort of flashing light on his head? I didn't time it very well, but I'll be in Korea for Halloween this year, and I'm pretty sure it's not really celebrated over there. I'm gonna be missing out! If I could celebrate, I'd probably just spread out a ton of sweets and watch vaguely scary movies all night (I'm kind of a scaredy cat). I don't have any plans for Halloween, but I'm really excited to get to see some trick-or-treaters this year. Usually, I'm not home on Halloween, but this year I will be! I probably won't dress up in costume, but there's a pair of Halloween leggings at Target that I have been wanting to get. I love Halloween! I'm usually all about it... but I'm in France this year (or technically, I'll be in London) and it's not really as big of a thing as it is at home. But I love all of the Halloween-themed things that my friends and favorite bloggers have been posting! Omg that Halloween Candy Bark! I'm gonna go repin everything on your board now. I'll definitely be checking out the DIY Halloween costumes for dogs! Haha, that's adorable! There must be some sort of lightweight stick-on light (like the type for cyclists) that you could put on the top? Hahaha! Pace yourself or you'll get a finger injury! I hope you find some good inspiration! Pet costumes are hilarious. Thanks! I used to lump most holiday stuff into one big board, but I recently split it into separate boards and they're much easier to keep track of! MASHED POTATO GHOSTS! So simple, so cute! Those bagels of doom (fantastic name!) are so fun to look at. Yes!!! I could make mashed potato ghosts just for the heck of it, doesn't even need to be Halloween! Your post reminded me to get out my Halloween decorations. I don't have very many, and I want more, so your Pinterest board (which I'm now following -- why I wasn't before I don't know) is giving me great ideas! Yay! I hope you make something new and fun!